Care for your soapstone countertops properly! Soapstone countertops are magnificent not only for their natural beauty but also for their ability to withstand life’s daily activities, many of which have the potential to scratch, stain, ding or dent. Soapstone is naturally non-porous, so it’s extremely stain resistant and incredibly durable. 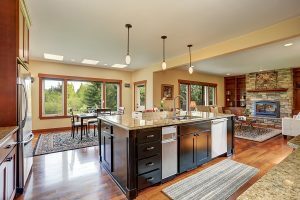 In fact, it’s able to withstand the day-to-day use and abuse that might cause other types of countertops to crack under pressure. As a result, soapstone countertops require minimal maintenance. An initial oiling to bring out the natural beauty, followed by an additional oiling yearly is all that’s required. The first oiling is the most important. After your soapstone countertops are installed and the glue has had time to dry, apply mineral oil directly from the bottle onto the countertops. Then, use a rag to rub the entire surface until every inch is covered. Let the oil sit on top of your soapstone countertops for about 30 minutes, and then wipe off any excess oil with a dry, clean rag. The initial oiling will bring out the natural beauty of your soapstone countertops. Remember, your soapstone countertops are non-porous, so they won’t necessarily soak up the mineral oil. Instead, it will evaporate over time, and the color of your counters will begin to fade. When you notice this beginning to happen, it’s time for a follow-up oiling. The size of the scratch will determine how to repair it. The deeper the scratch, the lower number grit sandpaper you’ll want to start with. Grit sandpaper is pretty rough and will sand quite a lot of soapstone quickly. As the scratch is sanded out, you will want to graduate to a higher grit sandpaper for a finish that will basically match the original grit finish. After sanding is complete, top off the repaired area with a little mineral oil or sealer. Your soapstone counters will look good as new! This entry was posted on Friday, September 15th, 2017 at 2:38 pm. Both comments and pings are currently closed.